Reference image from a previous protest action on May 4, 2018. Photo from United Steelworkers' Facebook page. Lucky Friday workers together with their families and union leaders marched on Saturday in Mullan, Idaho, to commemorate the one-year anniversary of the strike they initiated on March 13, 2017, to push for better labour standards. Lucky Friday, owned by Hecla Mining Company (NYSE: HL), is Idaho Silver Valley’s largest underground silver mine. It began operating in 1942 and is expected to have another 20-30 years of mine life. In 2016, the mine produced 3.6 million ounces of silver. But the workers’ stoppage, which is said to the region’s longest, has idled the mine. According to The Spokesman-Review, out of the 230 union workers involved in the action, 100 attended Saturday’s rally. They chanted “Mullan is a union town! We won’t let you shut it down!” as they marched from downtown to Lucky Friday’s picket line. The group says that the main issue at hand is “management's unfair labor practices.” The most sensitive point in the negotiation is that Hecla wants to change the seniority-based bidding system established in the 1980s and which governs work assignments. 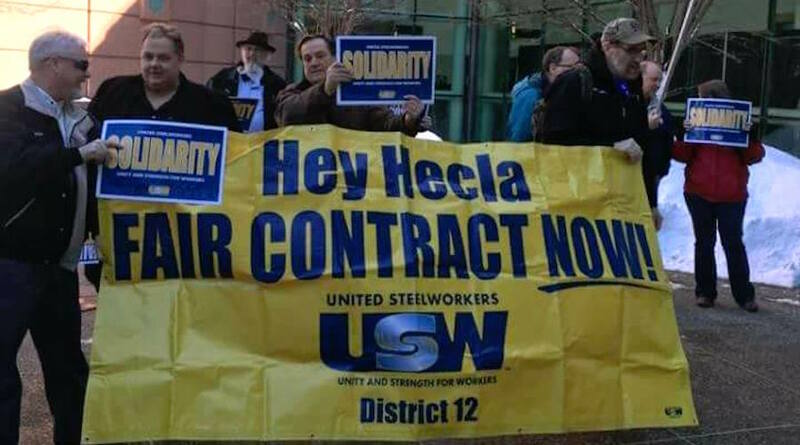 “The key topic is the Union’s desire to be the only mine in the United States where the senior employees dictate where and with whom they work,” Hecla posted on its website. According to the company, the system gives too much influence to senior miners who can pick their crews and bid on job sites at the mine, which are assigned to the most senior qualified miner and his team. They also dictate who can earn the upper end of the pay scale of $100,000 annually, and who earns on the lower end, around $60,000. However, the Steelworkers Local 5114 unit says the system rewards talent, builds loyalty, promotes a strong safety ethic and has broken production records. The company disputes these arguments. “The Lucky Friday has not broken any production records in recent years. In 2000, the Lucky Friday produced 5 million ounces of silver. In 2016, the mine produced 3.6 million ounces. In 2010, the Lucky Friday produced a record 351,000 tons of ore, and in 2016 the mine produced 294,000 tons of ore,” the miner’s website states.